Target and destroy all the wood destroying insects that are eating away at the structure of your home through our comprehensive termite tenting. Standard treatments are only capable of so much, and many situations call for termite fumigation. Our termite treatment team has the resources and experience needed for this advanced form of termite treatment. The moist and humid air of South Florida provides the perfect environment for termites and other wood- destroying insects to thrive in. Summer rains and severe thunderstorms can lead to small leaks in your roofing that soak the interior framing of your home. If termites find their way into the interior of your home, they are sure to find the moist wood they crave. When you begin to see termite droppings and evidence of leaks, it is vital that you contact us right away for solutions. Hire a team that knows how to get rid of termites, and has the equipment and resources needed for tenting a house for bugs. Get a home that is free of wood destroying insects when you take advantage of our termite tent process. Our team can provide you with an estimate on the termite house tenting cost, and have you back in your home as quickly as possible. We help you save compared to the standard cost of tent fumigation. Protect your home from destabilization and your family from harm with our pest control fumigation. Some of the most invasive and destructive termite species on the planet call South Florida home, and no matter how protected you may feel you are, things can change quickly. Our average temperature provides a fertile setting for mating, and many varieties of termite are beginning to form hybrid colonies. If an infestation is allowed to take hold at your home or business, it could prove fatal to the integrity of the structure. Many historic structures have been demolished due to the destructive nature of these swarms. Ensure your structure is strong and sturdy with our comprehensive process for termite fumigation. When you establish a partnership with our pest control team, we visit your home or business for a full inspection and evaluation. Standard treatments are often effective when you employ them as a preventative measure. But when an infestation has already begun, more powerful treatment measures may be needed. When termites find their way into your home, they rarely restrict themselves to open spaces and easily accessible places. These wood destroying insects are capable of reaching into the furthest of crannies and the deepest cracks behind walls. Only a full fumigation of your entire structure can reliably reach all of these hidden places and spaces. Any termite treatment that falls short of this level of reach is only postponing the inevitable. Keep a sharp eye attuned to any indications of a termite infestation. Early detection can help you save a great deal of money and effort in the fight against invasive termites. If you see a build-up of termite droppings near walls and other items of furniture, you may be in the midst of a full-fledged drywood termite swarm. Another indication to look for is discarded wings. After more than 10 years in this business, we know how to get rid of termites of all shapes and sizes. Whether you are experiencing a swarm of subterranean or drywood termites, we have a solution that will save your home. Our Spanish-speaking pest control experts can answer any question you have about your treatment plan, and they go the extra mile to ensure you are back in your home as soon as possible. Eliminate the bugs that threaten the stability of your home or business once and for all, and keep your family and pets protected from harsh chemicals when you hire our team for tenting. We employ the best practices for tenting a house for bugs, so that your home is secure and the air is safe to breathe. Before the tenting begins, we remove all living things from the home. We also remove plants and bag any food items that may be at risk. 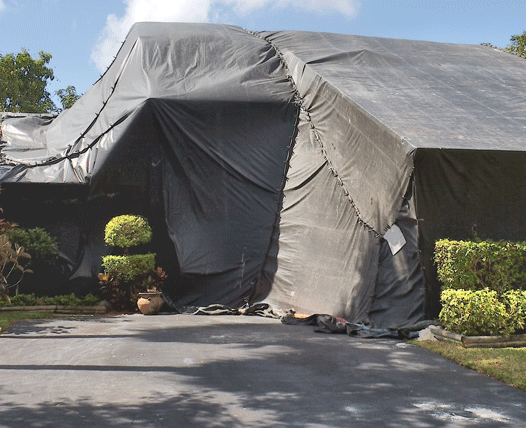 We prioritize the safety of your family and any nearby neighbors with our termite tent process. All of your entryways are locked, and the tenting is securely fastened to the foundation of your home. Warning signs are placed prominently around the home in advance of any fumigation. Once all of these precautionary measures have been completed, the fumigation process begins. The structure is filled with termite gas that is capable of reaching every place a termite can hide. Rely on our experienced team to help you protect the investment you have made in the place you call home by taking advantage of our competitively priced process. We give you a clear understanding of the tenting cost, so you never have to worry about being surprised by hidden fees. When you consider the level of investment you have wrapped up in your home or business, the cost of fumigation pales in comparison. Fight back against the swarms of subterranean and drywood termites that threaten your home every day with our process for pest control fumigation. In many cases we can have you back inside your home within 72 hours, depending on the level of treatment needed. Contact us today and ask about our free pest inspections and our advanced approach to termite tenting. We proudly serve clients in Miami, Miami Beach, Fort Lauderdale, Kendall, Homestead, and Coral Gables, Florida, and surrounding communities.